Tilting Delaware Bridge Stays Closed, Disrupting Interstate Travel : The Two-Way The I-495 bridge in Wilmington, Del., usually carries 90,000 vehicles per day. But it's empty now, as engineers try to discover what's causing eight support pillars to lean. 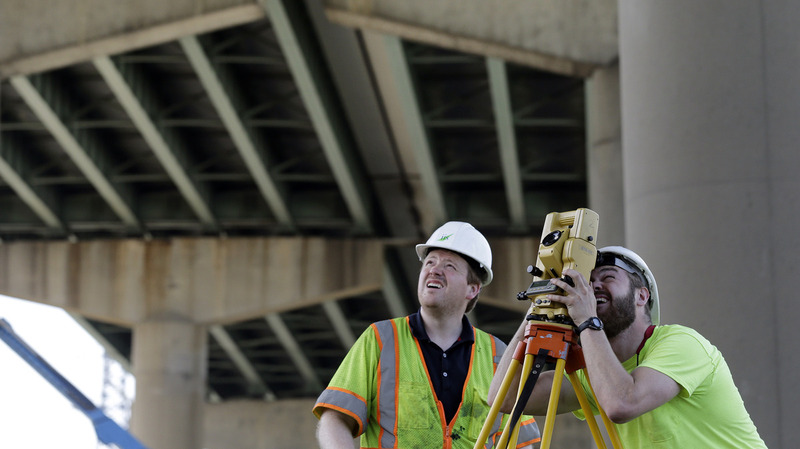 Surveyors work below the Interstate 495 bridge over the Christina River near Wilmington, Del., on Tuesday. The bridge was closed at the beginning of the week after officials discovered that eight support columns were tilting. A bridge on a major interstate in Delaware will remain closed indefinitely as engineers work to identify why four pairs of support pillars are tilting. The I-495 bridge, part of an 11-mile bypass around Wilmington, Del., normally carries 90,000 vehicles a day. It was closed on Monday after transportation officials became aware of the leaning pillars, which have tilted as much as 4 percent out of vertical alignment. Drivers are now being redirected through downtown Wilmington. Local traffic on Tuesday was substantially disrupted. "It was the nightmare from hell," Teresa Stewart tells Wilmington's News Journal. Other commuters report that their trips took three times as long as usual. But the effects of the bridge shutdown might extend far beyond Delaware. The closure disrupts a major East Coast thoroughfare just as the summer travel season kicks off. State Transportation Secretary Shailen Bhatt says that the bridge closure will be "a pretty significant traffic event" — not just for the city, but for the entire Northeast region, reports The News Journal. The bridge spans the Christina River, and the affected support columns are located on the eastern bank. The 50-foot pillars are leaning as far as 2 feet to the side, the newspaper reports, and the shift has also affected the concrete footer. Possible causes of the tilting include soil settling or the corrosion of underground steel pilings. The bridge was built in 1974, according to Delaware Public Media, and inspected every two years — most recently in October 2012. Officials say that the bridge is able to support itself, but that the weight of vehicles — particularly if traffic backed up on the bridge — might cause the structure to fail. In 2007, 13 people died when the I-35W bridge in Minneapolis collapsed during evening rush hour; last year, an Interstate 5 bridge collapsed in Washington state, with no fatalities. The Interstate 5 bridge was identified as "fracture critical," according to The Seattle Times, meaning that a bridge is at risk of collapse if one vital component fails. The main span of the Wilmington bridge is also classified as "fracture critical," but The Associated Press reports that the tilting section is not included in that classification. The bridge closure has led the Delaware Department of Transportation to send out notices from Maine to Florida describing alternate routes, reports the AP. And it looks like drivers will have to get used to those detours. Underground structural issues are difficult to address, Bhatt tells the AP. "It's not going to be open anytime soon," he says.